Before we even set foot in Tanzania, the materials mailed to me and my husband by our trekking company, Climb Kili, warned: “Your guides will set the pace and you may find it almost intolerably slow — bear with them it’s for a good reason.” In Swahili they say, “Pole-pole” (pronounced polie-polie) and it means “Slowly, slowly.” It’s one of the secrets to helping hikers acclimatize as they gain elevation on Mt. Kilimanjaro — going slowly prevents over-exertion, keeps the heart rate down and helps the body retain water instead of panting it away. The pace out of the gate was “pole-pole,” which means “intolerably slow” in Swahili. By Day 3 pole-pole was the new normal. No… Need… To… Rush… The phrase took on a life of its own and became applicable to a lot more than just the pace. Free of my iPhone, camera (Blake took way more pictures with his fancy Pentax) and unrelenting schedule dictated by life with children, I slowed down in a way I hadn’t for years. 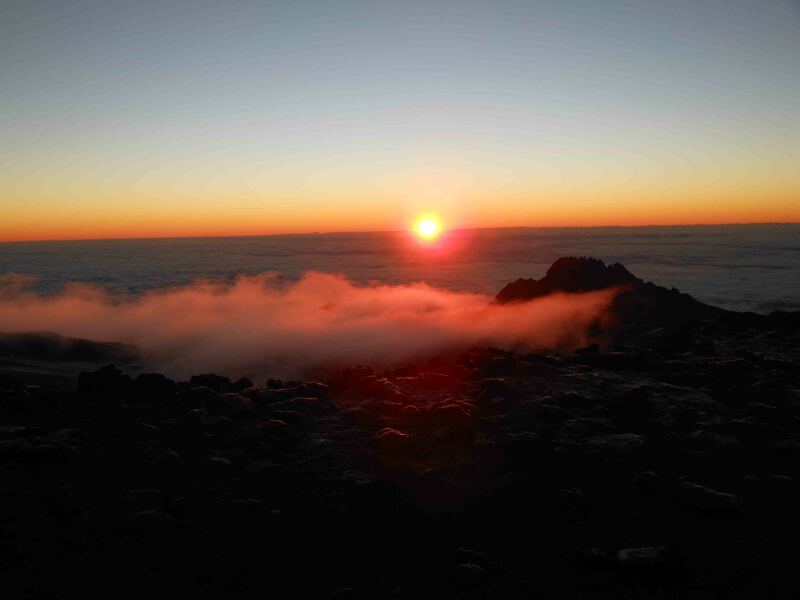 I let my mind wander as my measured steps transported me up Kili. At the time it felt meditative, and it was. In between thoughts about the kids back in Calgary, writing, life and travel, I noticed rocks and flowers and trees and birds, and always the snowy, domed peak of Kilimanjaro, looming closer by the day. The summit looks so far away from the Shira Plateau on Day 2. How will we ever get there going pole-pole? Good Luck took this picture for me at sunrise right after we summited. I didn’t dare remove my gloves! Well, it was always there, waiting, and we knew where the hike was leading (and that it might be a problem for some because of the altitude), but the pole-pole philosophy was huge in terms of helping us enjoy the journey. Below are some other key elements to our success and enjoyment. 1. Poles (the other pole-pole). I used to scoff at European hikers toting poles. But they really are knee-savers on the downhill, and I credit them with getting me down Kili — we descended some 12,000 feet in two days. Plus, I think they helped tone my triceps. Our group strikes a pole pose. 2. Gaiters. Well, not really (they did keep my legs remarkably dust-free. And warm), but I did go on about them daily: “I really love my gaiters!” I just embraced my inner hiking dork to the max. That includes the sun hat. Behold! Gaiter-clad hikers. I wore mine every day, religiously. 3. The porters. These guys were amazing. Even though we left camp before them every morning, they soon passed us on the trail carrying heavy loads (up to 60 lbs) that included our gear, sleeping tents, dining tent, food, table, chairs and the chemical toilet. They did not go pole-pole and when we arrived in camp in the afternoon our tents were set up with the duffles waiting inside. 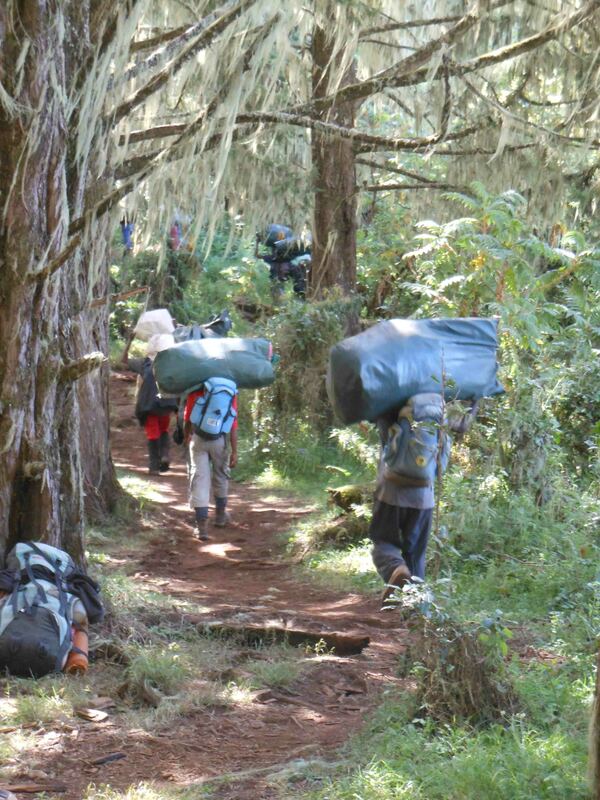 Our porters ascend through the forest on Day 2 carrying heavy loads. 4. The guides. We had one lead guide and three assistant guides between six clients. Evance (a.k.a. Pole-pole) set the pace, while Good Luck, Francis and Godbless brought up the rear. They also observed us constantly, and asked us how we were doing: “Jambo Lisa?” After so many trips up Kili, the guides probably knew by Day 3 if we would make it. Did I mention they even carried our day packs during the summit push? Good Luck, a.k.a. Mr. 100 Percent, rests on the trail. 5. The group. Blake and I met our fellow hikers on Day 1. You never know how the group dynamic will be — after all, you’ll be eating every meal with these people for eight days! 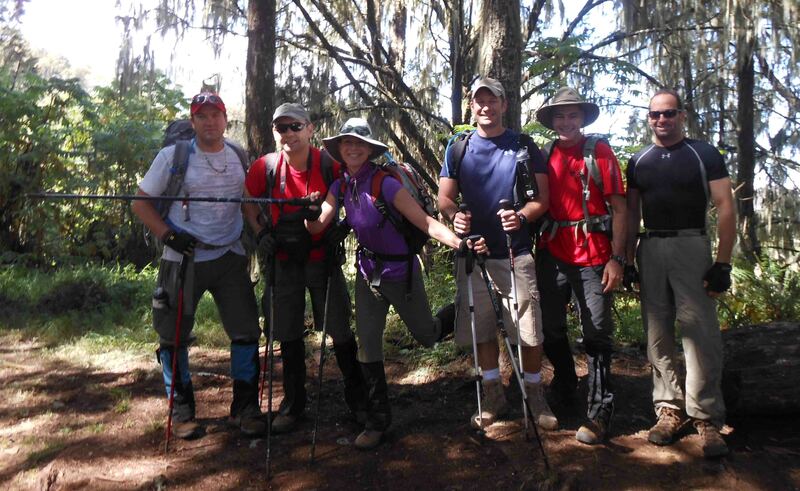 Fortunately, we had a good group: four men from the U.S. who made great hiking company. As a bonus they thought our jokes were actually funny! 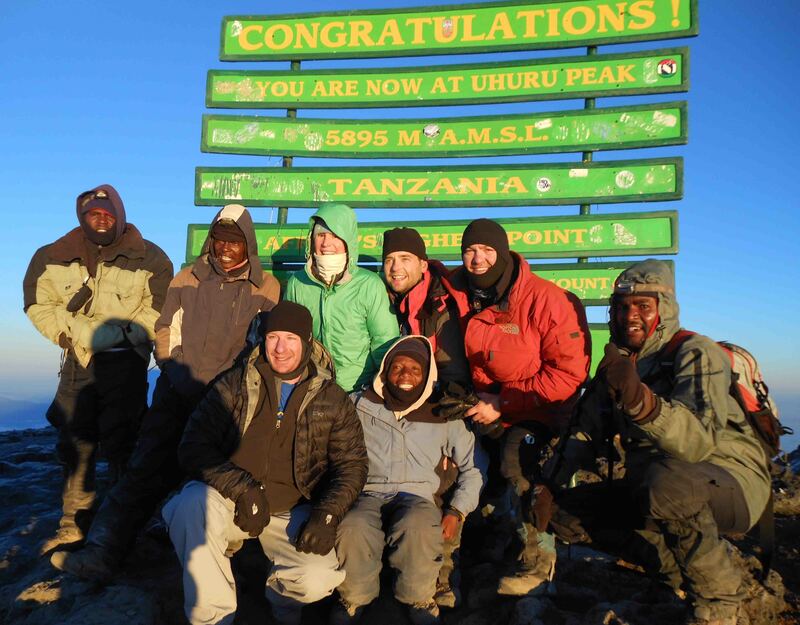 We were all in it together from Day 1 and supported one another across the Shira Plateau, over the Barranco Wall, and through the cold night as we pole-polied to the summit. Our group, minus Jeff and Alan (who were taking summit pictures and missed the group photo memo), poses by the summit sign. Taken all together, we made it to the top. Kilimanjaro? Hakuna matata! 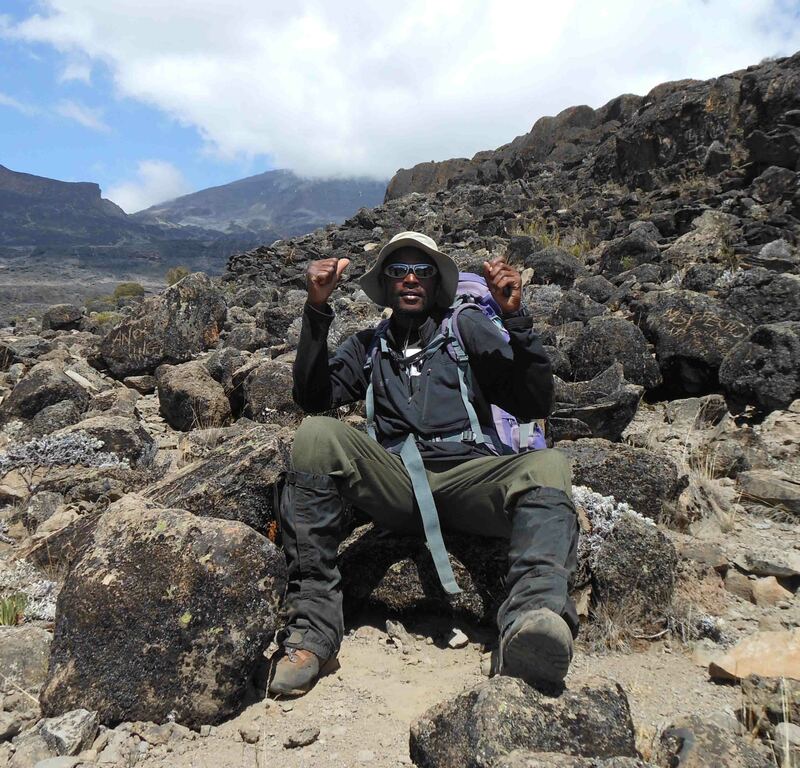 This entry was posted in Outdoor Adventure, Travel and tagged Climb Kili, Climbing Kili for a cause, Climbing Mt. Kilimanjaro, Pole-pole on Kili. Bookmark the permalink. 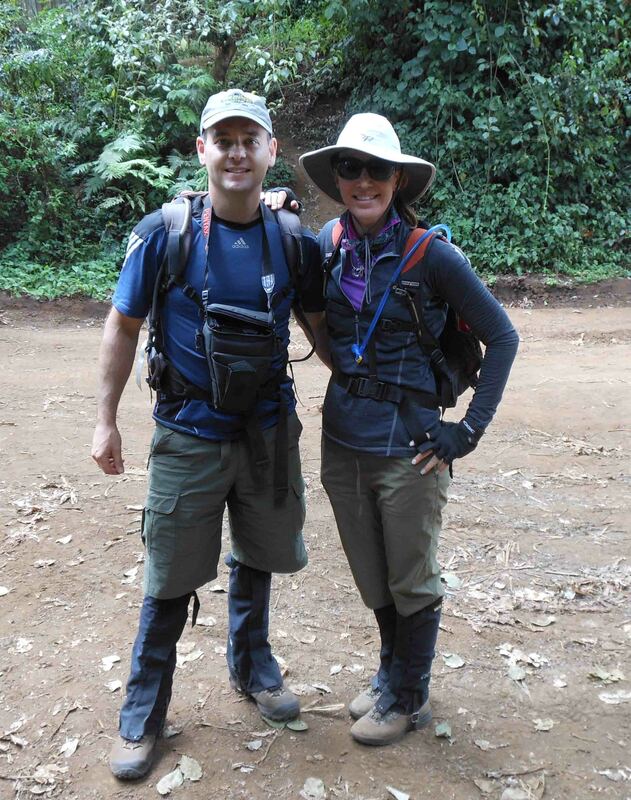 I love what you wrote about your Kili trip! Are you planning your next trip to Africa yet? Thanks Les! I wish I was planning my return to East Africa trip — Kenya + Uganda. When you and Kyle move there we will have a great excuse to visit! Love your blog! 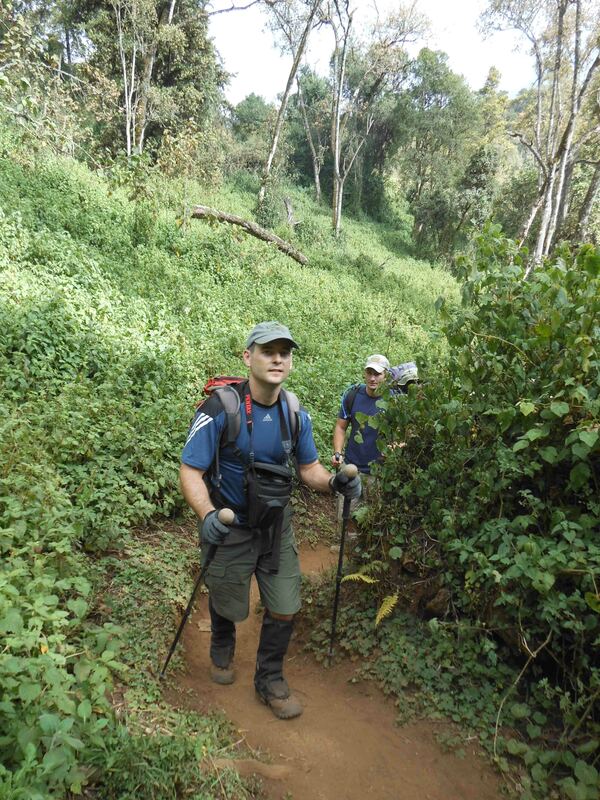 I am heading to Kilimanjaro in June and I really enjoy reading the experiences of others. Thanks! Kili was amazing. Loved, loved it. Train by hiking and remember to go pole-pole and you’ll be fine.